I recently finished illustrating a series of cards for the game Foray, an expansion set to the successful 2-player game, Morels from Two Lanterns Games. 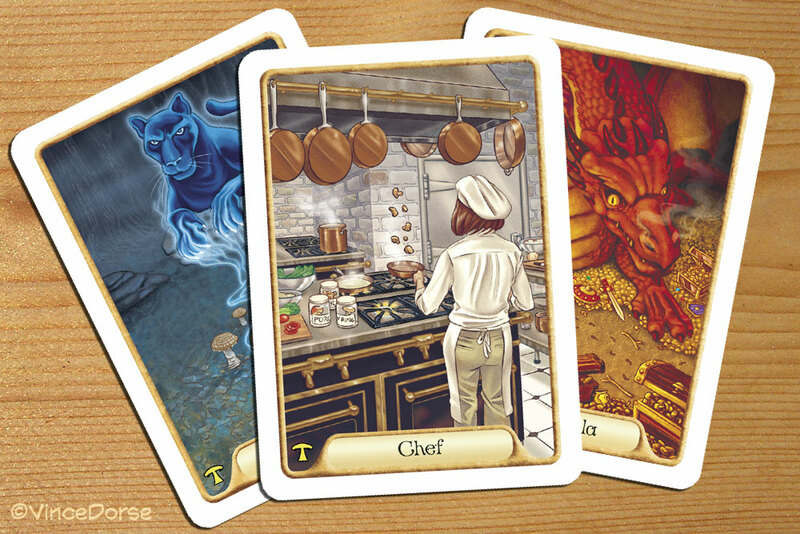 The games are mushroom-themed, and so most of the drawings revolve around foraging for, cooking, or eating mushrooms. Most of the cards have an interesting twist to them, and it was a lot of fun working on cards like that panther or dragon (above). 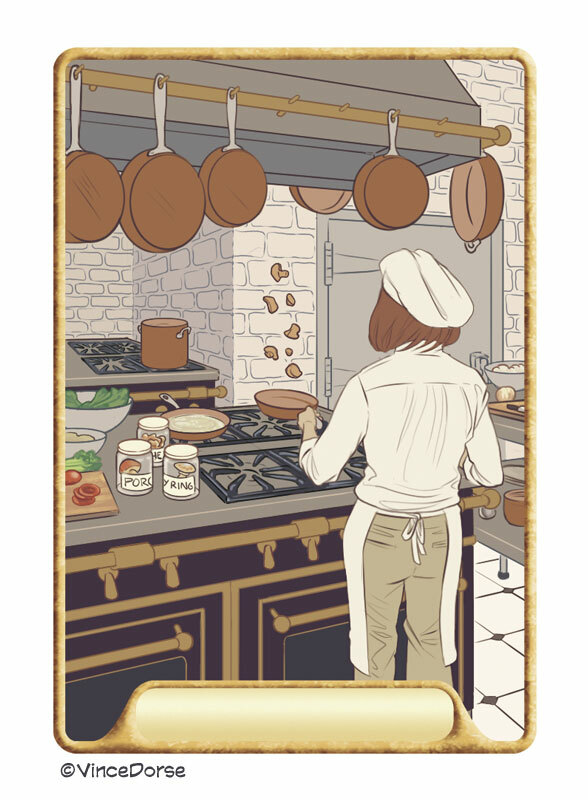 But honestly, they were relatively simple compared to the Chef card with all of its perspective, varying surface textures, and staging. Luckily, using Clip Studio Paint made the job a little easier. I scribbled out my initial sketch in Clip Studio. I roughed it in loosely, just trying to get an idea of where the drawing was headed. Then I set up my perspective rulers. As you can see, I was in the ballpark, but not quite close enough. 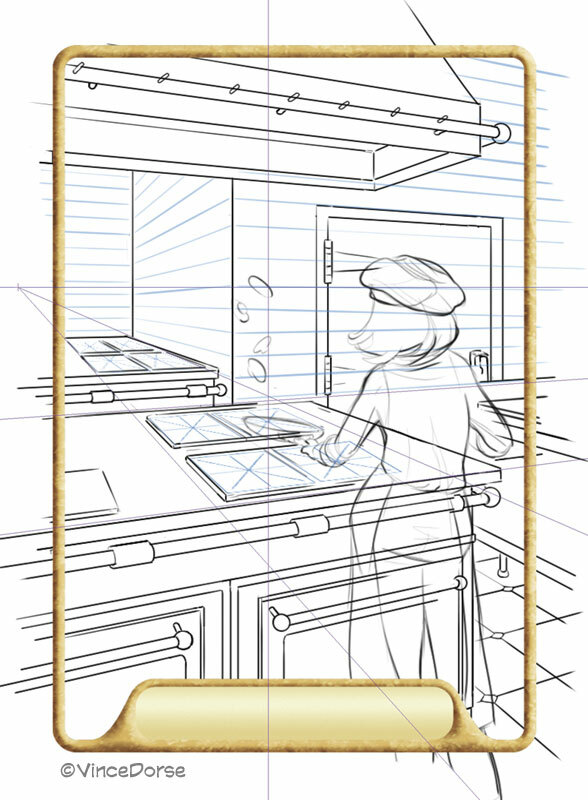 So using the rulers and a pencil tool, I redrew the kitchen in proper perspective (below). That’s better. 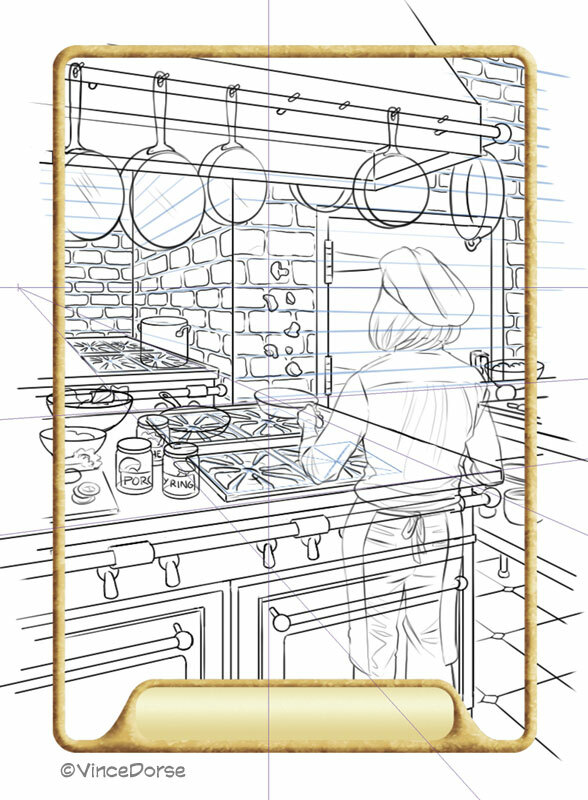 I also used the perspective ruler to set up some guidelines for the brickwork and even the metal grates on the stove top. 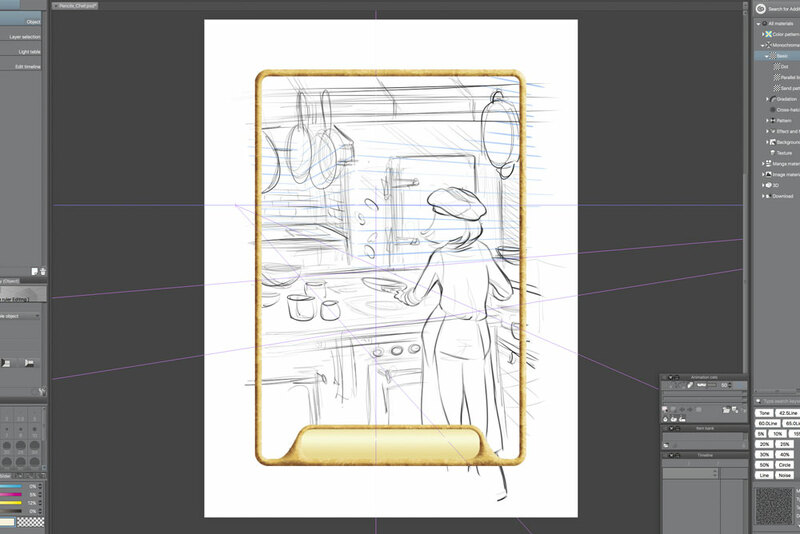 Toggling off the perspective rulers, I used the Clip Studio’s figure rulers to help me draw all those circles of the pots, pans, and jars. The curve rulers were used to make the smooth, curved outlines of the pot handles, bowls, jars, and other various objects. Then, since the client requested something more akin to realism than cartooning, I used a reference model to help me sketch out a more realistic figure. There is no ‘chef ruler’ so I had to do that freehand. Still in Clip Studio, I painted in the flats with a smooth, round brush. 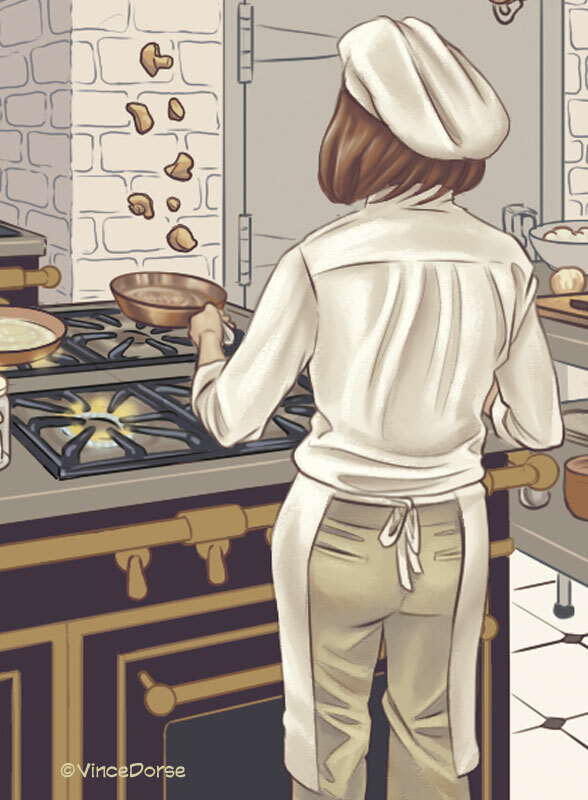 The client had very specific references for this kitchen, so all of those details (the fittings, tiles, bricks — even what the chef is wearing and the color of her hair) were specifically called for. Now you see what I mean? 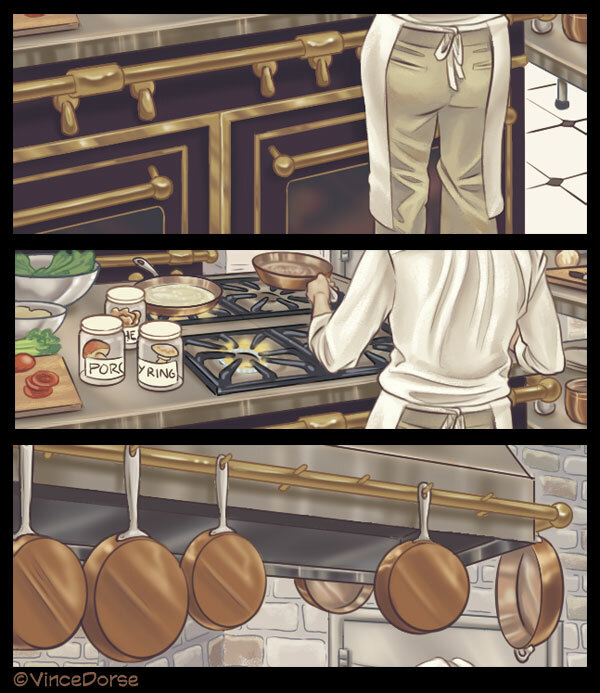 Compared to this kitchen, drawing that panther on a rock was a piece of cake! Now it’s time to turn up the heat and add the highlights, shadows, and surface texture of all the various objects around the room. I started detailing with the chef. I used some textured brushes to indicate folds in her clothing, and smoothed things out with a blender brush. There was some soft airbrushing in there too. Next, the brickwork. For the brickwork, I first ramped up the darks and lights to help with the illusion of depth. On top of all that, I used a chalk brush to paint in rough brick texture, changing up the colors every so often for variety. There were all kinds of surfaces in the drawing. Brass, copper, stainless steel, tile, brick, wood, etc. 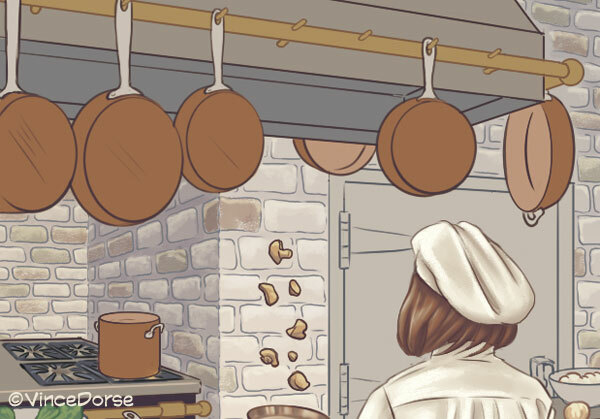 Clip Studio Paint has a nice selection of standard brushes that are great for rendering surface texture, but I’ve also collected and created a bunch of custom brushes over the years that helped me finish up this detailing. If you’re looking to expand your tool set, you can find custom brushes created by Clip Studio artists all over the internet, and they’re easy to install. So give it a try. 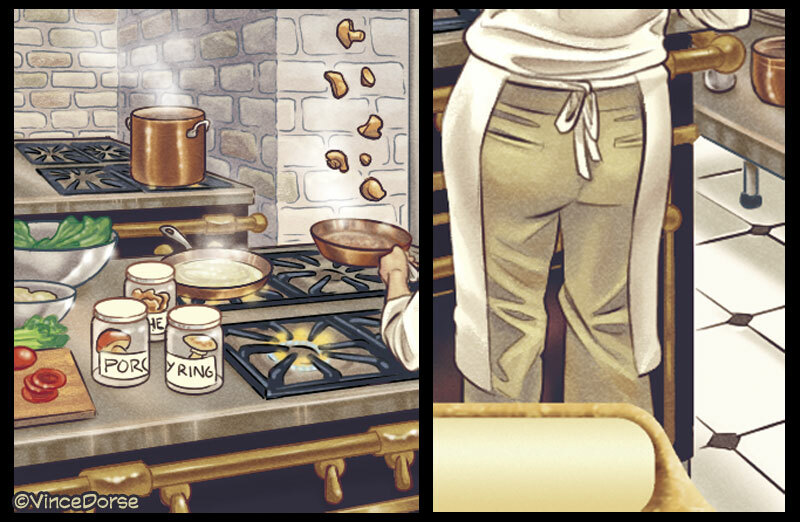 Some of the finishing touches I put in with the airbrush tool: steam rising from the hot pots and pans, glints of light reflecting off metal surfaces, cast shadow under the table falling on the tile floor. Then it was just a matter of making some tonal adjustments and the illustration was done. Cocker Spaniel card for the game Agility, coming in 2016. Did you see a post or a link somewhere that led you here? Was the Happy Holidays comic reposted in a particularly well-traveled corner of the internet? Just wondering because the influx of new visitors and followers jumped way up in the last month, so I’m trying to figure out why. If you have any ideas, feel free to leave them in the comments section. It’ll help me out.